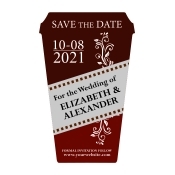 Coffee cup wedding save the date magnets are perfect to caffeinate your wedding festivities. A large cup of hot coffee helps to drive away morning blues and prepares a person to face a long and tiring day with ease. 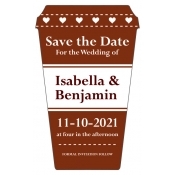 These wedding save the date magnets are crafted over large coffee cup shape magnets which pump enthusiasm with their typical shape. Free full color printing encourages couples to exercise their creativity. Avail free shipping anywhere within the contiguous USA. 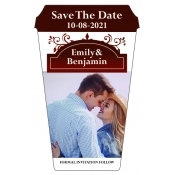 Coffee cup wedding save the date magnets essay many roles with ease. They are entertaining, romantic, reliable, adorable and affordable. They can be perfectly synchronized with various wedding themes such as destination weddings, color theme weddings, fairy tale weddings, wild African safari theme weddings and many more. People will be happy to receive an enthusiasm-booster save the date magnet which triggers their interest. We offer free art setup, free online design proof and lowest price match guarantee which allow couples to save on their investment. Wedding is one of the most beautiful events in the life. It is one of the most challenging and tiresome event, too. It requires careful planning to organize a wedding without overspending. There are certain areas where couples look for savings without losing the essence of the event such as wedding save the date magnets. Save the date wedding magnets are the perfect substitute to the age-old save the date cards which stood high chances of losing in transition. 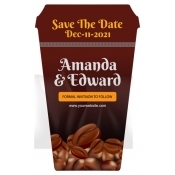 Magnetic save the dates have been around for a while, still coffee cup shaped ones are special because people cannot ignore them. They will love to retain them as a memoir once the occasion passes by. 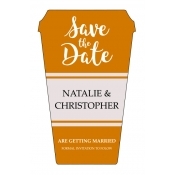 Your relationship and wedding memories will be deeply etched in their mind through these save the date magnets. We offer attractive discounts on wholesale orders of these customized magnets which make them an affordable choice for couples working on a small budget. They can avail them at cost effective prices along with envelopes. At Custommagnetsdirect.com, you can find envelopes which can bear your initials with pride. These envelopes can easily deliver your save the date invitations to the recipient. If you already possess a design, feel free to share it with us at art@CMagnets.com. Alternatively, you can upload it at the end of the product upload page. For knowing any comments, testimonials, experiences, and other details about these custom magnets, feel free to contact us at 855-762-4638 (Toll Free) or write to us at info@CMagnets.com.